I absolutely love grilled meat. Growing up my father could literally cook only two dishes, fried potatoes and boxed macaroni. However, he was great at grilling. He could make delicious chicken, ribs, steaks and my favorite corn. He was also very picky about the type of grill that he owned. We were a charcoal grill household and my father refused to even consider, much less use a gas grill. He also refused help or pretty much anyone to help him man the grill. My mom would prep the meat and veggies and then her job was done. When I grew up and got married I quickly learned that my husband had the same grill obsession as my father. My husband is a die hard charcoal grill fan and won't even hear about a gas grill coming anywhere near our house. In the summer we use both our outdoor grill and my indoor grill plate frequently so I was very interested when I noticed a recipe for Chile-Rubbed Grilled Chicken with Salsa in the June issue of the Food Network Magazine. This recipe has 13 ingredients. It takes 30 minutes of total time, all of which is active and makes 4 servings. 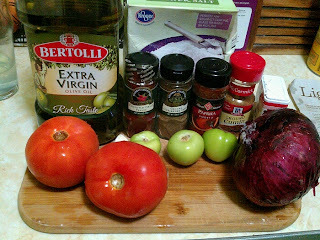 I had no problems finding any of the ingredients at my local grocery store and made no ingredient modifications. I did end up using packaged lime juice due to my lime going bad before I made this recipe. The recipe has the spice mixture made in a bowl and then the chicken turned to coat. I did things a little differently. Instead of a bowl I made the spice mixture and then rubbed it into the chicken and placed it in a plastic bag to marinade. Without rubbing the spice mixture into the chicken the rub wouldn't have fully coated the chicken. Finally, my chicken took much longer than the 4 to 6 minutes suggested by the recipe. I used my indoor grill plate and my chicken breasts were very large so my time was almost twice as long to fully cook. I followed the remainder of the recipe as written. This recipe worked very well the next day cut into strips and served in a tortilla with beans, cheese and salsa. I actually liked this method better than the recipe. The recipe needs a few tweeks. 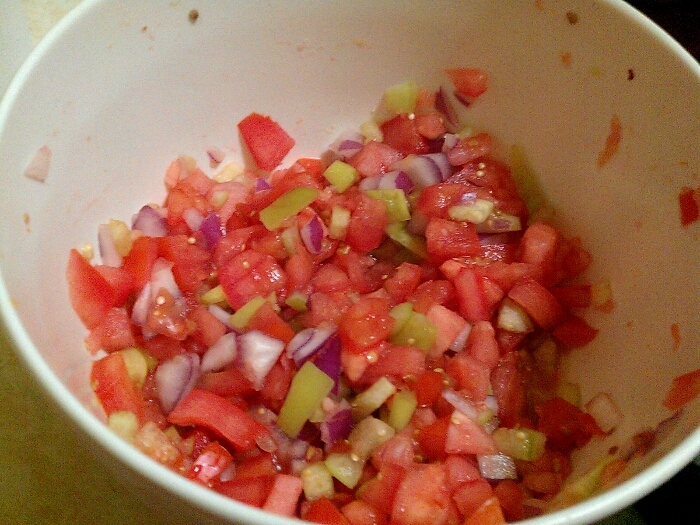 First, the salsa needs more lime and a jalapeno for more flavor. You could either seed the jalapeno or leave the seeds in for a spicier salsa. I would increase the lime to 2 tablespoons and make sure to add salt to taste. For the chicken I would suggest pounding it flat instead of butterflying. I had a horrible time getting my breasts to butterfly since they were half breasts and the thickness varied from side to side. Finally, make sure to get nice grill marks on the chicken to ensure that the spices are evenly distributed. With these changes I think this recipe could be great, especially when served with tortillas, yum! For the recipe go to Chile-Rubbed Grilled Chicken with Salsa. It's charcoal grilling all the way here, too! Although, I just recently got a grill plate and I LOVE it!! The only thing is that it's a pain to clean, but otherwise very useful. Can't wait to give this recipe a try (with your tweaks!). Thanks, Frugal! mm...my brother got me a george foreman grill for my birthday, am definitly going to have to check this one out! I have a foreman also and love it :) It's great for fatty meats since all the fat drains off! This looks so good! I will definitely be trying it. New follower from the hop! Followin w/ Aloha hop love! yummy blog! Thanks :) Going over to check out your blog! As the Grill Queen, I must try these!